These leather chappals act as Heat removal source from the body. Kolhapuri Chappals, also known as Maharaja's Chappals are one of the finest reminiscents of India's historic culture. Kolhapuri chappals are Indian hand-crafted leather slippers that are locally tanned using vegetable dyes. Kolhapuri Chappals or Kolhapuris as they are commonly referred to are a style of open-toed, T-strap sandal which originated from Kolhapur, a southern district in the state of Maharashtra. 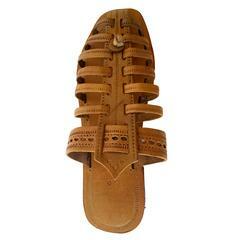 These chappals/sandals are handcrafted with Punching And Braids Design on The Upper Belt of the chappals. Wear these master pieces with Kurtas, Dhotis or style up with jeans and get a party-wear look. Stand out from the crowd on your ethnic day party! 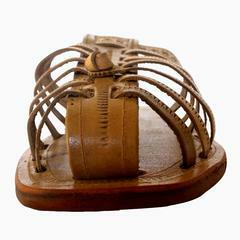 These leather chappals act as Heat removal source from the body. The Tan leather finish of the chappal adds on to its decency. It's a perfect blend of comfort and durability at an economic price. 1. If the Chappal/Sandal is stiff/tight, apply little Castor oil with the help of cotton on the Base to soften it. 2. As these are handcrafted sandals/chappals, minor variations in design and shape may occur as compared to shown pictures. 3. Since, these sandals/chappals are made up of pure leather, they need due care. To have a long life, shine and look, it is recommended to polish the sandals/chappals twice a week. 4. 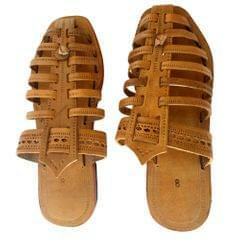 These sandals/chappals are best used in the Summer and Winter seasons. This is a handmade product and there might be slight irregularities. These are inherent to handmade products and they add to their charm! Product colour may slightly vary from the image shown due to camera light conditions and your monitor color and temperature settings.